Carved from a box elder tree’s leaning trunk that once threatened Tom and Judy Gehrz’s West St. Paul home, St. Francis now surveys the busy street near his perch in the couple’s front yard, just as he might have studied creation in a less urban environment. The Catholic Church celebrates his feast day Oct. 4. 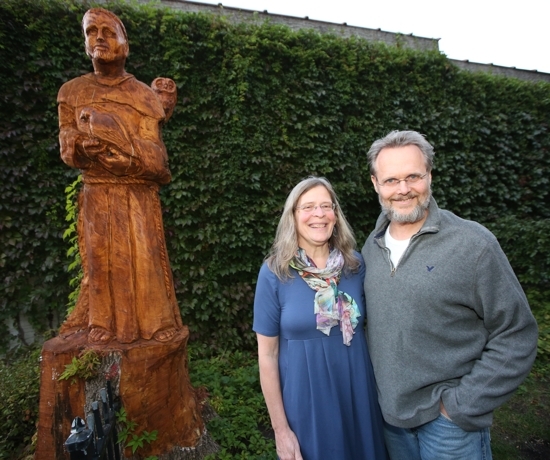 The Gehrzes and parishioners at Our Lady of Grace in Edina, where Ingvoldstad did another carving this summer, are also appreciating the beauty of trees still integral to the landscape though entering a new phase of their lives. St. Francis might have approved of the way the Gehrz’s tree took root in its urban environment. The couple first noticed it a year after moving into their house with their then-baby daughter, Mary, the eldest of their eight children who grew up in the house. When building their 3-foot-high steel border fence in 1994, they left an opening for the flourishing tree. But by this year, the majestic 40-foot tree’s two trunks had grown together and its 3-foot diameter trunk had completely fused into the fence. One of the trunks leaned toward the house, and the other towered over an adjacent commercial building. The tree’s declining health convinced the Gehrzes they needed to cut it down this spring. “The tree had to come down, and we didn’t want to take it all the way down because we would have had to replace the fence,” Tom said. They saw carving as an alternative to removing the stump, and they contacted Ingvoldstad, who in the past 18 years has carved close to 1,000 trees around the country using chainsaws, grinders, blow torches and other tools. Carving St. Francis out of their tree seemed natural for the couple, who’ve always kept a small statue of the saint in their yard. Ingvoldstad also recognized the couple’s affinity with nature. 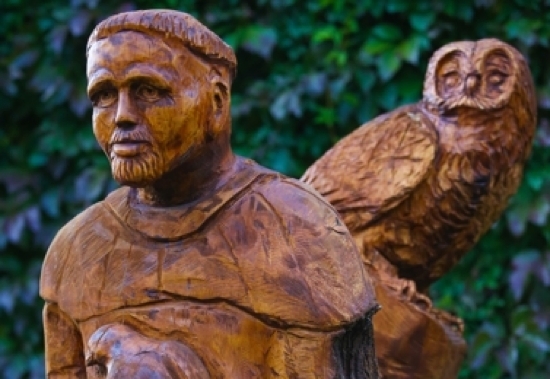 Over a week and a half in late May, Ingvoldstad carved the St. Francis statue on one trunk and, on the other stump, an owl — a fitting companion for the nature-loving saint. The stained and finished sculptures will last at least 10 years but possibily much longer, depending on the wood, how it’s maintained and forces such as rot, fungus and insects, Ingvoldstad said. While Judy misses the tree’s shade, she said, “It’s nice to have a thing of beauty there.” A vine-covered wall provides a more natural backdrop. “The sparrows sit in there and convene,” Judy added. Reaction to the statue has been favorable, though some don’t recognize the saint. Seeing an evangelistic opportunity, the couple said they may offer cards with information about the saint’s life or attach an explanatory plaque to the statue’s base. 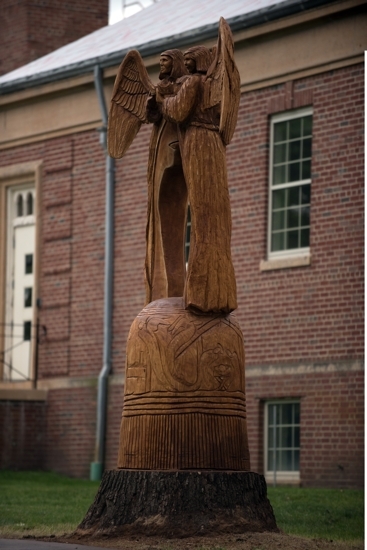 After establishing St. Francis on St. Paul’s West Side, Ingvoldstad carved an image of the Blessed Mother from an oak tree on the Our Lady of Grace campus in June. Estimated to be 130 to 150 years old — twice as old as the parish — the tree was split in half by lightning last year, said Deacon Bob Durham, parish business administrator. Located near the school, it was deemed unsafe and requiring removal. Deacon Durham asked the arborist instead to cut it to 12 feet, as he thought the 40-inch-diameter stump might make a good carving. Ingvoldstad carved the trunk into an open silhouette of Mary framed by an arch supported by two large angels. Forming the angels’ spread wings from another piece of the trunk, Ingvoldstad attached them to the arch. He carved into the base of the trunk simple images including the annunciation, the nativity of Jesus and the crucifixion. Father Finnegan will bless the statue later this month. The statue is more than a carving, Deacon Durham said.